The K&N Apollo CIS (Closed Intake System) is a universal type air intake system incorporating a washable/reusable K&N High-Flow Air Filter. The Apollo's specially designed shape increases volumetric efficiency and provides the benefits of an open cone filter and standard air box in one unit. Heat buildup is reduced which keeps the intake charge cool. Smooth internal features minimize air turbulence and maximize air flow. The Apollo's outer shell is made of a durable lightweight material that helps keep incoming air cool as it enters the engine chamber. 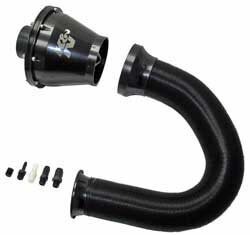 K&N's Apollo system includes a cold air hose with a specially designed radius end cap so cooler outside air can be directed into the engine. The Apollo has a 70mm base flange. It is supplied with a pack of vent adaptors to incorporate most engine breathers and temperature sensors from the original air box assembly back into the Apollo. Included vent sizes are 1/2" outside diameter, 3/8" outside diameter, 1/2" outside diameter, 5/8" outside diameter and a blanking plug if a vent adaptor is not required.